Handwriting analysis has existed in European languages for centuries but this is the only book that made handwriting analysis possible in Arabic, Urdu, and Persian. 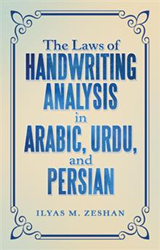 Ilyas M. Zeshan’s new book, “The Laws of Handwriting Analysis in Arabic, Urdu, and Persian” (published by Archway Publishing), relies upon his more than 30 years of experience studying graphology, or handwriting analysis. “Handwriting analysis has existed in European languages for centuries but this is the only book that made handwriting analysis possible in Arabic, Urdu, and Persian,” Zeshan says. His book enables the reader to gain knowledge about the science of handwriting analysis and how it is used to asses a person’s emotional and mental state. Zeshan writes that handwriting analysis also offers self-knowledge as it reveals one’s assets and vulnerabilities, allowing for personal examination and improvement. How does one determine whether an ‘Alif’ is tall or too tall? When an ‘Alif’ is more than 4 times taller compared to the other letters it can be regarded as a tall ‘Alif.’ If its height reaches five times or higher it is considered too tall. As the height of ‘Alif’ goes up, so does the pride of the writer. A slightly tall ‘alif’ is desirable in some professions such as advertising, consulting, and designing. These writers grasp the intangible aspects of the business rather quickly and comfortably. When an “Alif” is too tall, i.e. its height is five times or greater than the other letters, it reveals that the writer’s ego is overblown. This person possesses great ideas, but struggles to implement them. Ilyas M. Zeshan was born in Karachi, Pakistan. He earned his master’s degree from Chicago’s Roosevelt University in international relations and continued his studies for a Master of Business Administration. He has worked as a writer on international relations, as a graphology instructor and a graphologist. Zeshan previously published two books on the subject of handwriting analysis and appeared on radio and television programs in the United States. He currently resides in a suburb of Washington, D.C.